AT&T will be making a presentation to the Mendocino County Board of Supervisors at their November 1st, 2016 regular board meeting. The presentation is a timed item for 10 am. In this presentation, AT&T representatives will sharing information on their buildout plans for the Connect America Fund Phase II (CAFII) and an update on the completion of their North Coast Resiliency Plan. AT&T announces that their completed upgrades will provide diversity to over 91% of the fiber on the North Coast and make the network “self-healing.” These upgrades greatly reduce the potential for widespread impacts from any one fiber break. All the information formerly posted here has been moved to it’s own sub-menu “CPUC Proceeding” under the main menu “In the News”. Join us for a lively discussion and to provide your input on the broadband needs for Fort Bragg’s businesses and Anchor Institutions. All interested parties are invited to attend. How important is broadband for your business currently, using a scale of 1 – 5, with 5 being highest? Do you see broadband being important in 5 years? 10 years? 20 years? Are your broadband needs being met? If not, why? What is your definition of “good broadband infrastructure?” Does Fort Bragg currently have it? Is the current broadband infrastructure “good enough” to attract new businesses? Is it “first-class” or “second-class” or worse? Are we satisfied with what is offered? How does the current lack of diverse routing affect your business? Is there a demand for super-fast broadband (fiber) in the urban core? What are the barriers to getting it? If there is a need/demand, how can we aggregate that demand and turn it into opportunity? How can we collaborate and unite the business community? Join us for a lively discussion and to provide your input on the broadband needs for Ukiah’s businesses. All interested parties are invited to attend. What is your definition of “good broadband infrastructure?” Does Ukiah currently have it? Could the urban core of Ukiah be a place for super-fast broadband? The Broadband Alliance is proud to host a special presentation by Computers for Classrooms, a non-profit based in Chico, CA. But don’t be fooled by the name – they offer high-quality and low cost computers to a variety of individuals and organizations (see the qualifications pdf). Don’t let the (normally) high cost of a computer keep you or your child from falling on the wrong side of the Digital Divide, because this organization can help provide you with affordable options. Join us on May 20th to learn more. Computers for Classrooms will also be accepting donations of computers and electronic equipment on this same day. Avoid your outdated equipment ending up in our local landfill, or having to pay shipping costs to a recycling facility. The CBC was established by legislation in 2010 (Senate Bill 1462-Padilla) to marshal the state’s resources to further the objectives of increasing broadband network deployment, and eliminate the Digital Divide by expanding broadband accessibility, literacy, adoption, and usage. We need to let them know that the Digital Divide grows wider and deeper in our rural communities, and hold them accountable to this important responsibility on behalf of all our residents. The nine-member CBC is composed of leaders in their fields: Michael Peevey, President of the CPUC and Chair of the CBC; Senator Alex Padilla, vice-Chair and who helped establish the CBC; Assembly member Steven Bradford, Carlos Ramos, Director of the CA Dept of Technology; Mark Ghilarducci, Secretary of the CA Emergency Management Agency; Tom Torlakson, State Superintendent of Schools; Fred Klass, Director of General Services; Brian Kelly, Secretary of the California Transportation Agency; and Sunne McPeak, President of the California Emerging Technology Fund. More information about the council can be found at broadbandcouncil.ca.gov/home.aspx. We would like as many people as possible to attend this meeting, so please mark your calendar and see if there is any possible way for you to attend. Their meetings include a 20-minute public comment period, and even if there is not time for everyone to speak due to our large turnout, your presence at the meeting will send an important message. Please let us know if you are planning to attend, and if you would like to carpool. We plan to meet as a group before the meeting to share media materials, so please stay in touch and share this information with as many people as possible. The Broadband Alliance will attend the Point Arena Planning Commission’s public hearing on a fiber to the school deployment project to commend AT&T for this forward-looking step. The Alliance will also discuss the persistent digital divide in the Point Arena area that will remain after completion of this project. Tuesday, January 7, 2014 at 5:00 p.m.
Executive Order 13616 is intended to make broadband construction projects along Federal roadways and properties cheaper and more efficient. This page provides current status of implementation of EO-13616. The Broadband Alliance of Mendocino County will host an invitation only meeting between the California Telehealth Network, and health care providers in Mendocino, Sonoma, and Lake Counties. This meeting is intended to jump start CTN membership applications – application deadline is 03/31/12. For more information, please send email to info@mendocinobroadband.org. 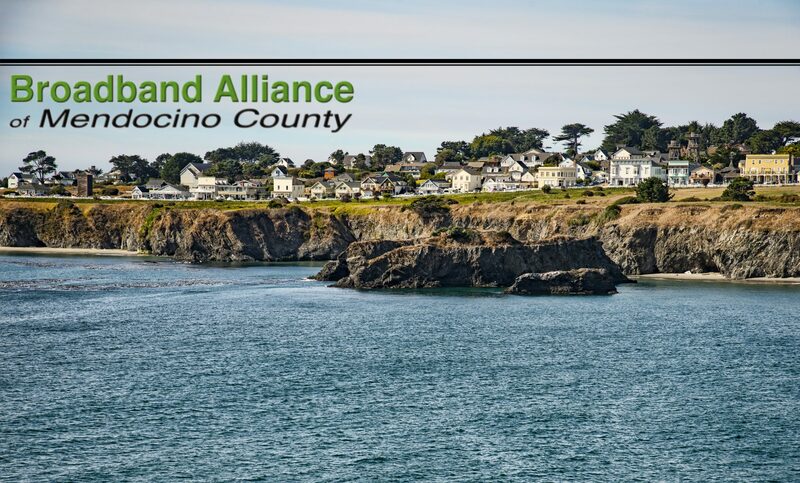 On Friday, January 6, 2012, the Broadband Alliance of Mendocino County will host the counties of Sonoma and Lake in an invitation-only meeting to discuss broadband issues of mutual interest. All three counties are intimately entwined economically, and all three need significant improvement in broadband infrastructure. Regardless of funding sources, our three counties will always remain neighbors, and will always need to work together to ensure universal broadband deployment. Collaboration will lead to better, more easily funded, projects while reducing overall planning costs. This invitation-only meeting will be the first step in forming an ad hoc, but ongoing, relationship between the counties to facilitate broadband deployment projects that span county boundaries. We hope to establish informal inter-county working groups that can inform the formal broadband development planning in each county, and that can facilitate contractor/carrier operations when working on multi-county broadband deployment projects.